Neighbours Cafe is located on the corner of Inkerman and Chapel Streets in East St Kilda - all on its lonesome, opposite the tram stop. Which is good, because it means it's easy to find (the bright commissioned graffiti walls don't hurt with that either) and parking is easy. It's utilitarian urban interior sits well in its surrounds, but makes the discovery of the large green garden and covered back verandah, an added surprise. It's worth making a dedicated trip just to come here though, because they take the quality of their food and their coffee very seriously. Neighbours Cafe has its own special blend of Hookturn coffee, using 4 South American beans which produce a mild, satisfying roast. They are soon to introduce a second 'garden' blend with another coffee machine which will operate in the garden space on weekends. There's also a good range of muffins to accompany your caffeine hit, and the hot chocolates are delicious - not too sweet. The small menu is well priced and uses some exceptional produce. My family love the breakfast menu, with most dishes around the $8.90 mark. Their Acai grain porridge, with creamy yoghurt and rhubarb compote on the sides is a winner, as is their bircher muesli, home made toasted banana bread and pancakes. Lunch usually has a couple of delicious specials on offer and vegetarians are well catered for - halloumi salad and sweet potato salad specials were both on offer when I went in. The small kitchen is right in the heart of the cafe and the service is accordingly on show the whole time - it's friendly and down to earth: just as you might want from your neighbours. Definitely worth a visit. 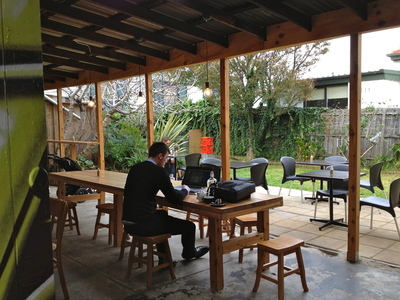 I have driven past this cafe many times and that outdoor space is a real surprise! I'll definitely drop in sometime now I know there is a little oasis out the back!